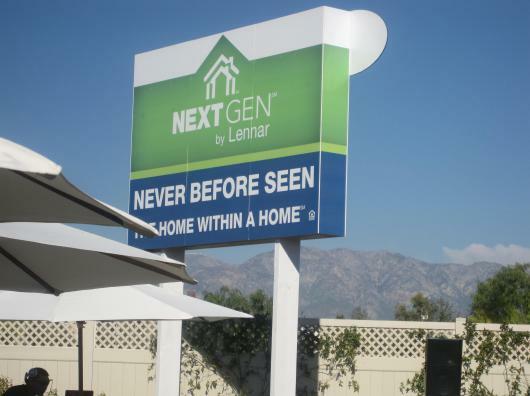 Last week, I was interviewed by correspondent Sarah Gardner for the "Marketplace" program, which runs on public radio stations nationwide, for the "NextGen" series of homes now being built by Lennar. This program was aired this afternoon nationwide. Although other builders such as Standard Pacific and Taylor Morrison have also built homes with multiple generations in mind, Lennar's been getting most of the press regarding this trend lately (including a story in the L.A. Times). You can listen to this segment via podcast or read a transcript by clicking here. On Friday morning the rest of my interview will run along with the latest stats on new home sales. So is this the beginning of a big trend for the industry? Way too early to say, but it certainly merits watching. It's also not a product that would work just anywhere: you'd need enough of a customer base which thinks intergenerational housing is a good thing. Want to get a handle of the demographics of specific areas you're considering? Contact us at MetroIntelligence!